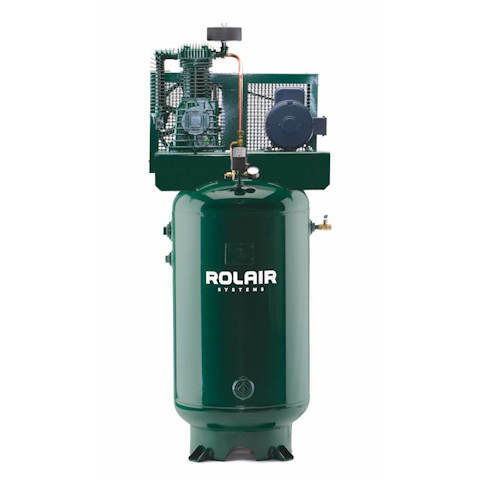 5 HP, two-stage electric stationary air compressors on a variety of tank configurations. Model V5180K30 shown. Click to view all models in this category. Two-Stage, Cast-Iron Cylinders, Aluminum Head and Crankcase for Faster Heat Dissipation, Ball Bearings, Splash Lubricated, Bearing Inserts on Connecting Rods, Swedish Lammelar Reed Valves, Oil Sight Gauge, Low RPM's to Ensure Long Life and Trouble-Free Performance. 1740 RPM, 60 Hz, Open Drip-Proof Motor. Single Phase Models Available in 208 and 230 Volt. Three Phase Models Available in 208, 230, and 460 Volt. H5160K30 5 Single 60 Gallons, Horizontal 1740 23.1 @ 175 PSI 18.0 @ 175 PSI 52" 20" 49" 435 lb. V5160K30 5 Single 60 Gallons, Vertical 1740 23.1 @ 175 PSI 18.0 @ 175 PSI 30" 20" 77" 430 lb. H5112K30 5 Single 120 Gallons, Horizontal 1740 23.1 @ 175 PSI 18.0 @ 175 PSI 72" 30" 53" 675 lb. V5112K30 5 Single 120 Gallons, Vertical 1740 23.1 @ 175 PSI 18.0 @ 175 PSI 40" 30" 74" 665 lb. H5360K30 5 Three 60 Gallons, Horizontal 1740 23.1 @ 175 PSI 18.0 @ 175 PSI 52" 20" 49" 425 lb. V5360K30 5 Three 60 Gallons, Vertical 1740 23.1 @ 175 PSI 18.0 @ 175 PSI 30" 20" 77" 420 lb. V5380K30 5 Three 80 Gallons, Vertical 1740 23.1 @ 175 PSI 18.0 @ 175 PSI 30" 24" 77" 490 lb. H5312K30 5 Three 120 Gallons, Horizontal 1740 23.1 @ 175 PSI 18.0 @ 175 PSI 72" 30" 53" 665 lb. V5312K30 5 Three 120 Gallons, Vertical 1740 23.1 @ 175 PSI 18.0 @ 175 PSI 40" 30" 74" 660 lb. V5180K30 5 Single 80 Gallons, Vertical 1740 23.1 @ 175 PSI 18.0 @ 175 PSI 30" 24" 77" 495 lb. H5160K28 5 Single 60 Gallons, Horizontal 1740 20.6 @ 175 PSI 15.3 @ 175 PSI 52" 20" 47" 414 lb. V5160K28 5 Single 60 Gallons, Vertical 1740 20.6 @ 175 PSI 15.3 @ 175 PSI 30" 20" 75" 404 lb. V5180K28 5 Single 80 Gallons, Vertical 1740 20.6 @ 175 PSI 15.3 @ 175 PSI 30" 24" 75" 469 lb. H5112K28 5 Single 120 Gallons 1740 20.6 @ 175 PSI 15.3 @ 175 PSI 72" 30" 51" 649 lb. V5112K28 5 Single 120 Gallons, Vertical 1740 20.6 @ 175 PSI 15.3 @ 175 PSI 40" 30" 72" 639 lb. H5360K28 5 Three 60 Gallons, Horizontal 1740 20.6 @ 175 PSI 15.3 @ 175 PSI 52" 20" 47" 409 lb. V5360K28 5 Three 60 Gallons, Vertical 1740 20.6 @ 175 PSI 15.3 @ 175 PSI 30" 20" 75" 399 lb. V5380K28 5 Three 80 Gallons, Vertical 1740 20.6 @ 175 PSI 15.3 @ 175 PSI 30" 24" 75" 464 lb. H5312K28 5 Three 120 Gallons, Horizontal 1740 20.6 @ 175 PSI 15.3 @ 175 PSI 72" 30" 51" 645 lb.